Page F30: Iranian protesters on 30 July / 8 Mordad: "we can win this"
Iranian protesters on 30 July / 8 Mordad: "we can win this"
That's from part of an article here summarizing yesterday's protests, where there seemed to be much less security than expected, or perhaps security is just getting tired of fighting with protesters, hard to say. Last time a large protest was arranged security made an iron wall around Tehran University to keep people from entering and that's what drove them onto the streets and alleys instead, but this time they were able to enter the cemetery and protest there as intended. Plus everywhere else afterwards. 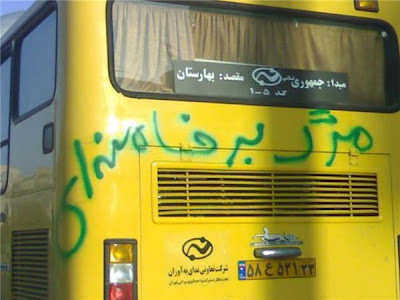 Here's an image that apparently is from yesterday: it's a bus with death to/down with Khamenei spraypainted on the back. Tagging buses like this is easy and effective. You can read a writeup by the Christian Science Monitor on the mourning cycle here.